New York's Guggenheim Museum, one of Wright's architectural masterpieces, is the inspiration for these items. The stepped banding gives them an exceptionally clean, simple, smart and Deco look, that will fit in with traditional and contemporary room settings. 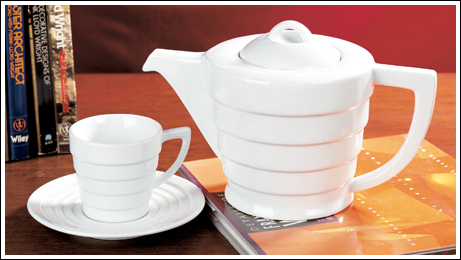 The white tea cup holds 5 oz, and comes with saucer, To complete your Guggenheim Tea Set, we also have the matching Cream & Sugar, which measures appr 4" high. All pieces are dishwasher and microwave safe. (Sorry, the Teapot is sold out. ).